In just her fifth year of practicing law, Amber Brown already has made a solid name for herself in the Twin Cities’ legal and nonprofit communities. 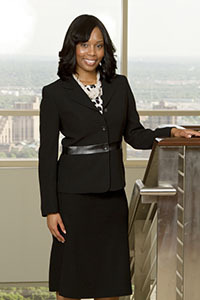 Brown, 28, was set on her career path the way many attorneys are: as an argumentative child. “I was told over and over, ‘You should be an attorney,’” she said. She took that gift for impassioned advocacy seriously, to where the only obstacle left was her own misconceptions about the legal field. An associate at Fredrikson & Byron, Brown guides a corporate and securities practice that involves helping clients with a variety of transactions, including public and private securities offerings, governance, and mergers and acquisitions. Brown said her mentors at Fredrikson didn’t waste any time helping her get her feet wet. She has worked to transfer those skills to the nonprofit world as well, serving on the board of the Metropolitan Economic Development Association and helping to found the BizGrow Network, a national network of nonprofits serving minority businesses.